Can you confirm these amateur observations of Saltuarius cornutus? N Cape York Peninsula near Coen, Townsville to Cooktown, Stanthorpe, extreme SE Qeensland through coastal New South Wales. Type locality: Bellenden-Ker Ranges, NE Queensland. Types Lectotype: AMS R749 Cairns district, Qld (Cairns & Grant). Designation by Cogger et al. (1983), as determined by Shea & Sadlier (1999). Diagnosis DIAGNOSIS (genus): Nostril in contact with rostral (vs not contacting the rostral in Phyllurus); anterior margin of interclavicle flat, or forward projecting without distinct process, Fig. 2a-d (vs bearing a distinct process); axilla not, or only very rarely and shallowly, invaginated (vs always, sometimes deeply invaginated); epipubic cartilage moderate to large, wedge-shaped, Fig. la-d (vs small - moderate, wedge-shaped); male preanal pores present, Fig. 5a-c; save for one species (from COUPER et al. 1993). 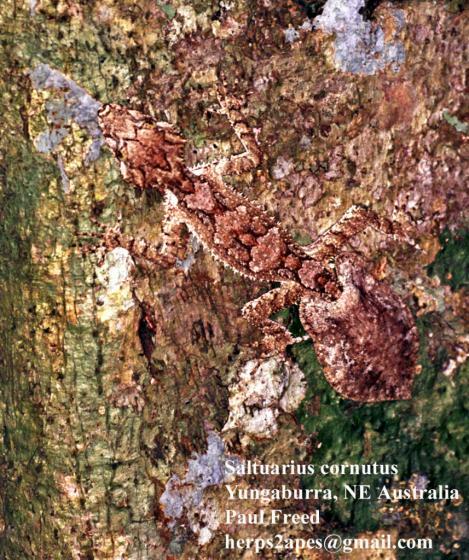 Comment Phyllurus cornutus seems to be a composite species. Type Species: Gymnodactylus cornutus OGILBY 1892 is the type species of the genus Saltuarius. Etymology ETYMOLOGY (genus): From the Latin - 'keeper of the forest'. Barrett, Charles 1950. Reptiles of Australia. Cassell & Co., London, 168 pp. Swanson, S. 1976. Lizards of Australia. Angus & Robertson, Sydney 80 pp.